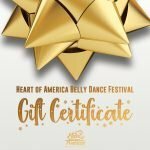 Eyes of Bastet 2nd Place performance in the 2016 Heart of America Belly Dance competition. Judges: Raqia Hassan, Aziza of Cairo, and Samia Du of China. Choreography and troupe members Nashid and Lisa Jean of Manhattan, Kansas. Nashid and Lisa Jean are 2 of the founding members of the Eyes of Bastet from Manhattan, KS. They have over 20 years combined experience in the art. The troupe was formed in 2007 with the goal of sharing their love of the dance while promoting multicultural acceptance and awareness of women’s issues. Lisa Jean holds a degree in dance from Kansas State University and enjoys incorporating modern dance with traditional belly dance. Nashid is the Director of the Eyes of Bastet. She teaches Middle Eastern Dance and Culture at Kansas State University.